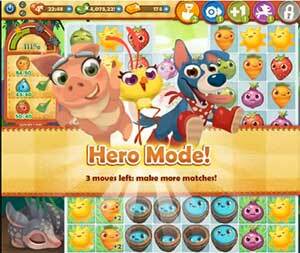 These Farm Heroes level 401 cheats and tips will help you beat level 401 of Farm Heroes. 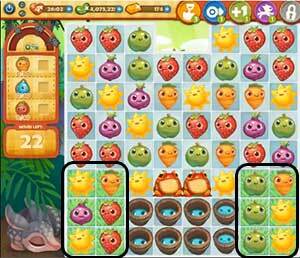 The objective of Farm Heroes level 401 is to achieve 100% growth and collect 80 orange carrots, 40 water droplets and 40 red strawberries in 23 moves or less. Because you need to collect so many cropsies with only 23 moves, you need to maximize every one of those turns. Grass squares make the cropsies happy and put plus boosters on the required cropsies in all levels. What you want to do is to make matches with the required cropsies in the grassy areas. This will put more plus boosters on them so you can collect more required cropsies per match. While you are making matches in the grassy areas, you can also be making matches adjacent to the water buckets. When you make matches next to water buckets, they begin to fill up, and eventually spew out water droplets. Because you have to collect 40 water droplets as well, this is a great way to kill two birds with one stone. The problem is that there are only 12 total grass squares on the board, so you can only match 3 cropsies vertically on the grass at a time. There are two red frogs that sit right on top of the water buckets in this level. This is where all of the action will take place because you want to be making moves on the grassy squares and adjacent to the water buckets to generate water droplets. Because the frogs are red, they will eat red strawberries, which you need to collect 40 of! They jump around the board and scoop up all of the red strawberries in the surrounding area with their long spiraling tongues. They only jump when you make a match adjacent to them, so remember this while you are collecting cropsies. This makes collecting the red strawberries a primary task because once you collect your quota, you don’t have to worry about the frogs anymore. 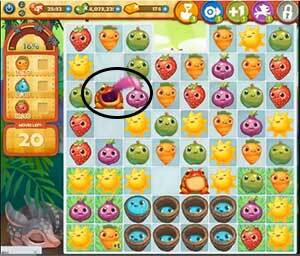 After you do collect the required amount of red strawberries, the frogs can actually help you by taking the strawberries off the board. Hopefully they get replaced by orange carrots, because you need to collect 80 of them, double the amount of the strawberries and water droplets you are required to collect. Level 401 Cheat #3: Use Hero Mode to achieve maximum growth. If you happen to collect all the required cropsies with moves left to spare, Hero Mode will activate. In Hero Mode, required cropsies get more plus boosters added on to them so you can achieve a higher growth percentage. Use this time to make more matches with the required cropsies that have the most plus boosters on them. The more growth you achieve, the more stars you’ll be rewarded. The more stars you are rewarded, the more magic beans you’ll receive. Magic beans are used to weaken Rancid the Raccoon in levels he appears in, so they are very good to accumulate and stockpile.